Let's not kid ourselves; wrinkles are unavoidable. While much of why we get them has to do with the inevitable effects of aging, there are quite a few other factors you may never have considered. To fully understand how we age and what causes the development of wrinkles, it helps to better understand the basic anatomy of our skin. The epidermis is the outermost layer of the skin that serves as a barrier to external elements. Within this layer, new cells are constantly growing and pushing older cells closer to the surface, where they will eventually be shed. If this process ever becomes abnormal, the skin can appear scaly and flaky. The second layer of skin is the dermis. It contains the structural elements of the skin, including key connective tissue. Different types of connective tissues serve different functions. Collagen gives the skin its strength and plumpness, while proteins known as glycosaminoglycans provide structural rigidity and elastin imparts flex and elasticity. The dermal-epidermal junction lies in between the dermis and the epidermis. This important structure forms fingerlike projections, called rete ridges, which increase the surface area of the epidermis exposed to blood vessels, allowing it to better absorb essential nutrients. The bottom layer of skin is the subcutaneous tissue, which is largely made up of fat cells that insulate the body and make skin appear plumper and fuller. It also contains our sebaceous glands, sweat glands, and hair follicles. Wrinkles and other signs of aging are caused by changes to our skin anatomy, as well as a number of factors we can control and others that we can't. As a person ages, epidermal cells become thinner and less sticky, causing the skin to look noticeably thinner. The lack of stickiness also hinders the skin's barrier function, allowing moisture to be released instead of being retained in the skin. This causes dryness. Not only do the number of epidermal cells decreases by 10 percent per decade, they divide more slowly as we age, making the skin less able to repair itself quickly. The effects of aging on the dermal layer are significant. Not only does this layer thin, but less collagen is produced and elastin fibers wear out. These changes in the structure of the skin, causing it to wrinkle and sag. Meanwhile, the sebaceous glands get bigger but produce less sebum while the number of sweat glands also decreases. Both of these changes lead to dry skin. At the same time, the rete ridges of the dermal-epidermal junction begin to flatten out, making skin more fragile and easy to shear. This process also reduces the availability of nutrients to the epidermis, interfering with the skin's normal repair process. Exposure to UVA and UVB rays from sunlight accounts for 90 percent of premature skin aging symptoms. Most of the photoaging effects, including wrinkles and dark spots, occur by age 20. The amount of damage the sun causes to the skin is determined by an individual's total lifetime exposure to UV radiation, as well as their specific skin (pigment) type. The epidermis becomes thinner and skin lesions, such as actinic keratoses, basal cell carcinoma, and squamous cell carcinoma, begin to form. In the dermis, the sun can damage collagen fibers faster than normal while elastin fibers begin to accumulate at abnormal levels. This accumulation causes enzymes called metalloproteinases to be produced in large quantities. Metalloproteinases typically repair skin by producing collagen, but sun damage causes them to malfunction and actually break down collagen. This causes the formation of disorganized collagen fibers known as solar scars. As skin repeats this imperfect rebuilding process over and over again, wrinkles develop. Free radicals are unstable oxygen molecules that have only one electron instead of two. Because electrons are found in pairs, the molecule must scavenge other molecules for another electron. When the second molecule loses its electron to the first molecule, it has to find another electron, repeating the process again and again. This process can damage cell function and alter the very genetics of a cell. Free radical damage causes wrinkles by activating the metalloproteinases that break down collagen, which is only made worse by even the smallest amounts of UV radiation, smoking, or exposure to air pollution. It is likely that the hormonal effects of menopause and decreased estrogen production are responsible for skin aging. However, studies have yet not discovered which skin changes are specific to decreased estrogen or which skin changes are a result of either sun exposure or normal chronological aging. By contrast, animal studies have shown that the lack of estrogen can cause a decrease in collagen levels of two percent per year, as well as a decrease in skin thickness of one percent per year. It's not an old wives tale. Habitual facial expressions can cause the skin to wrinkle as it loses elasticity. Frown lines between the eyebrows and crow's feet radiating from the corners of our eyes develop as the tiny muscles in those areas permanently contract. The effects of gravity make the loosening of the skin more apparent as it sags more under the influence of simple gravitational pull. 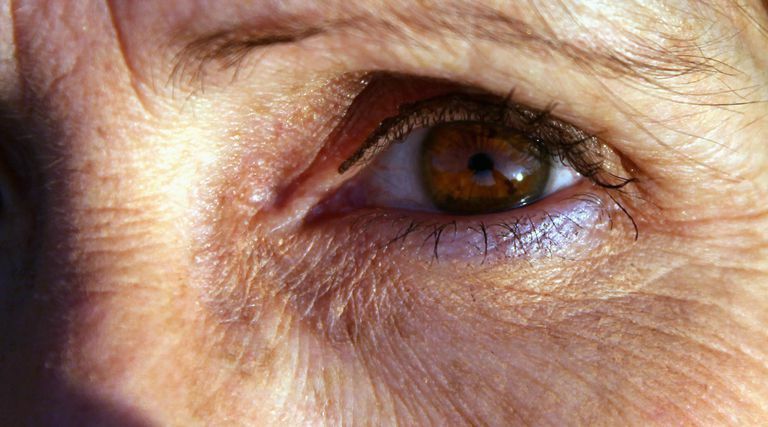 This causes the jowls and drooping eyelids we experience in older age. Do You Know What Causes Your Dry Skin? What Are the Causes of Keloid Scars?